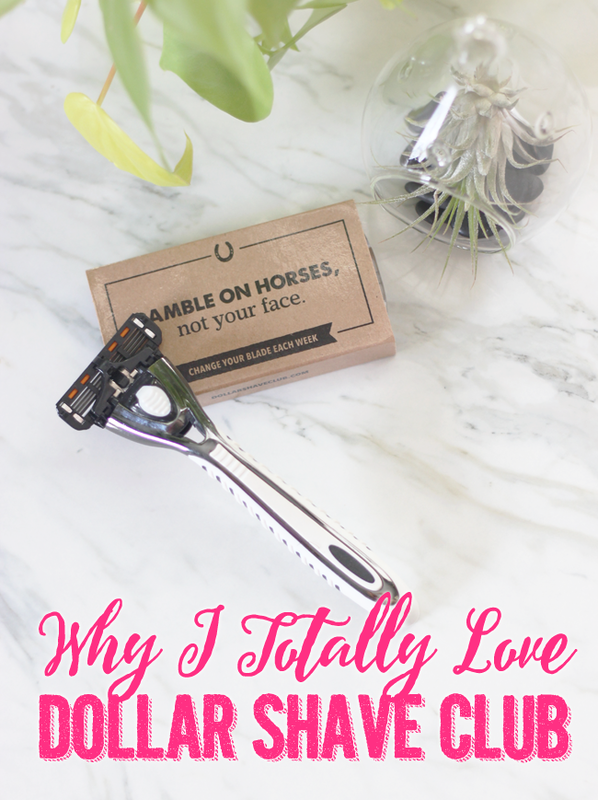 If you haven’t seen Dollar Shave Club’s infamously popular commercial, you need to give it a watch- I remember thinking it was really funny and well done, and even shared it on my Facebook wall, but never really did much after that. At the time, I had been purchasing my razors from Costco (when I had a membership back in Chicago) and I had the fun habit of being sort of a cheapskate who also never went to the pool, I didn’t really use razors that much. If I did go sport a bikini, I’d wonder why I’d get razor burn. (Note to self: razor burn is not worth saving a few bucks, it looks like something is wrong with you in the bikini area and it hurts). Fast forward to a year or so later, and I’m using a lot more razors and I’m really tired of the “pink tax” and all these expensive add-ons that I don’t want just because a product is made for women. I had made the mistake at thinking that Dollar Shave Club was just for dudes, and that mistake has cost me a lot of money. I thought I could gamble the razor system by simply using whatever was on sale, and ended up with several shave handles, and never really circled back to stock up on refills because they were then, full price. The cycle repeated itself. I finally bit the bullet and got Dollar Shave Club, and I must be the last person on Earth to give it a try. I got my first box two months ago, and was really impressed with the quality of the blades for $6 a month. The reusable handle came with my first order, and I was getting 4 new blades every month. This month, I was also able to enable the feature to skip a month, and since I don’t have to shave my face every day, I probably only need 2-3 a month, so I’m happy to skip a month when I don’t need it. While they do have boxes that are a just $1 (with $2 shipping), I have opted for the mid-level package that includes 4 blades/4 cartridges at $6 a month. I may switch down later just to see what the other packages are like, but so far, I’ve really liked the blades. 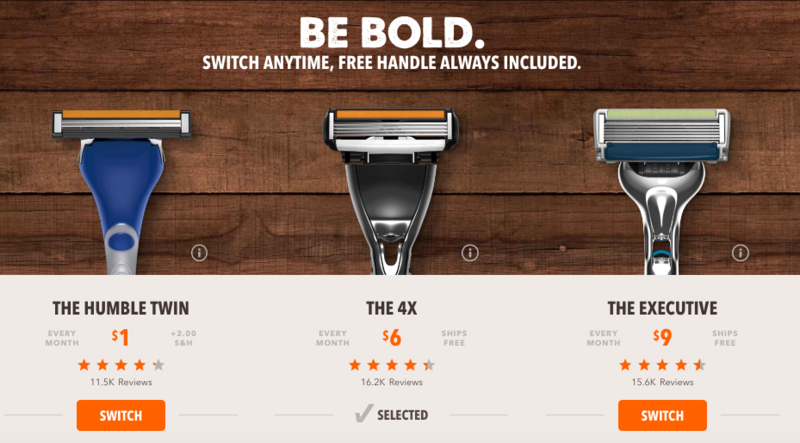 Dollar Shave Club is now also adding some fancy and frugal, albeit, manly, add-ons. If you’re so inclined and you don’t need your lip balm, after shave and shave cream to be in estrogen affirming lady colors, you can opt-in for any add-ons to come with your next box. I am ascribing to the hope that by using a subscription system that’s affordable I won’t run out of blades ever again, nor will I be tempted to shave any thing sensitive with an old blade in the future. (Shudders). I’m really excited to get an extra handle with my next order for the fella, along with some shave butter and other goodies that are always good to throw in a to-go bag. Interesting. I’ve seen them advertised, but like you, assumed it was just for men. I currently use Schick Intuition (Lather and shave in one? Yes please! ), but could be persuaded to try something else. I hear men’s razors are better than women’s, anyway. Totally- I know there are some great razors out there, but I’ve really loved getting new ones every month so I’m sure I never run out and I can’t beat that price! Plus, it’s nice having one set of cartridges between the two of us, boyfriend says the quality is bueno! I never thought of ordering from here! When I moved in with my BF I just ended up “stealing” his razors and cartridges since they seem to be much higher quality. He has started to notice though, and I would love to have an option like this! Thanks for the review!! You bet! 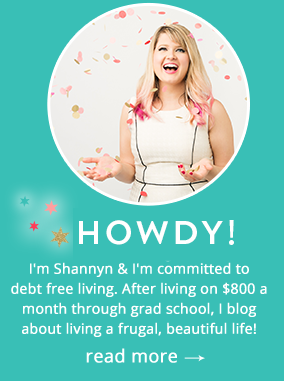 I have LOVED the service, and it’s helped me cut down on the mishaps I typically find when I try to save a buck and either use cheap razors or overuse my good ones (like cutting myself or razor burn)… so it’s been a win!